Paul Goldschmidt still leads the Southern League in most offensive categories despite not appearing in a game since July. He's since moved on to bashing for the NL West-leading Diamondbacks in the Majors. 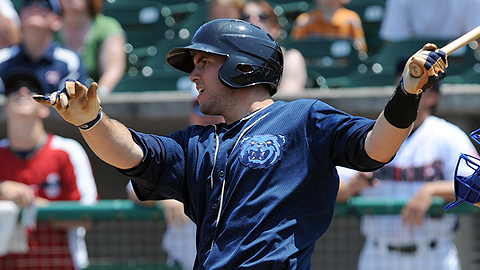 Goldschmidt was one of 15 players selected to the Southern League's 2011 postseason All-Star team on Wednesday, a squad that also includes current Major Leaguer Nathan Eovaldi. Goldschmidt, a first baseman, ranks fifth in the circuit with a .306 average and leads the league with 30 homers, 94 RBIs, a .435 on-base percentage and a .626 slugging percentage with Double-A Mobile. He was promoted to Arizona on Aug. 1 and has four homers and 15 RBIs in 25 games in the Majors this month. Eovaldi was also promoted after his Aug. 1 appearance with Chattanooga -- he's 1-2 with a 3.46 ERA in five starts for the Dodgers. With the Lookouts, the right-hander went 6-5 with a 2.62 ERA in 20 outings. He was selected to the SL team as the top righty starter. Joining Goldschmidt around the infield is Montgomery catcher Stephen Vogt (since promoted to Triple-A Durham), Birmingahm second baseman Tyler Kuhn, Mobile third baseman Ryan Wheeler and Mississippi shortstop Tyler Pastornicky. Carolina's Denis Phillps and Mobile's A.J. Pollock joined Chattanooga's Alfredo Silverio and Scott Van Slyke in the All-Star outfield. Braves slugger Ernesto Mejia was selected at designated hitter. Rays top prospect Matt Moore was named the best lefty starter -- he has also since joined Durham. Tennessee's Rafael Dolis was voted the top reliever. The league's lone award went to Jacksonville's Kevin Mattison, who was voted the "Best Hustler."